On the Astral Plane, there are colours and shapes and textures which manifest themselves in sensory perception and interpretation, much in the same way as they do on the earthly plane. This is something which I try to capture within my artwork. In this piece, we can see a field of oranges, golds, creams and whites, mixing and swirling against one another in a cascading, incorporeal motion. But, amid this, we see solid lines and textures, placed within the field. This is because there is ‘physicality’ here, in the way that we would understand it on Earth – there is insight and understanding to be gained, even in this apparently ephemeral mix of colours and shapes. 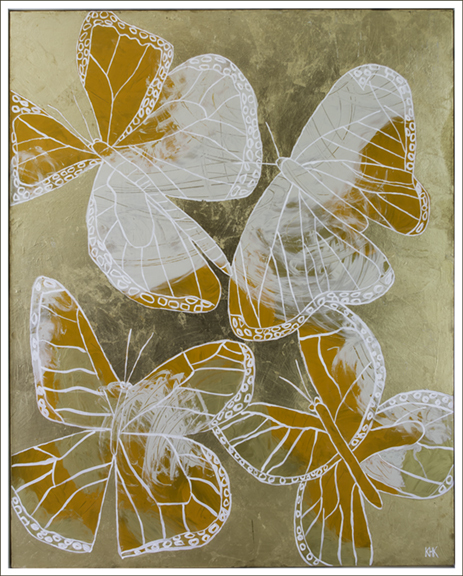 In the foreground, there are butterflies; transient evocations of a physical soul. There are guides in the Astral Plane, beings who can be communicated with. They can tell us something real – something true – about the worlds we inhabit. Acrylic on canvas with gold leaf (mixed media) signed original. Framed with new acrylic white box. Photo’s on request. Inspired by the Monarch Butterfly.